Sanju Sahai, also known as Vishnu, is one of the finest and most sought after tabla players in Britain. Plays recitals and concerts, and for Indian weddings. 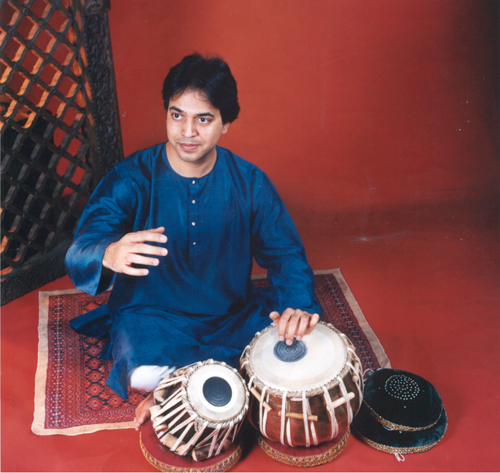 Sanju Sahai, also known as Vishnu, is currently one of the finest and most sought after tabla players. He is the direct descendant of Pandit Ram Sahai, the founder of the Benares Gharana. He is the sixth generation of tabla player in that family. Sanju was trained by his guru Pandit Sharda Sahai, the virtuoso tabla player. He has established himself as an internationally recognized tabla player, and is one of India’s upcoming musicians. He is an A grade artist for All India Radio. Sanju began playing tabla at the age of four, demonstrating his prodigious skilled aged nine in his first public performance. He has accompanied many of India’s legendary musicians, such as Ustad Amjad Ali Khan and Aashish Khan (sarod), Pandit Rajan and Sajan Mishra (vocal), Pandit Birju Maharaj and Gopi Krishna (Kathak), Vishwa Mohan Bhatt (guitar), Bhajan Sapori (santoor), Umyalpuram Shivraman (mridangam), Ustad Sultal Khan (Sarangi), and Shrinivas (mandolin), to name but a few. Sanju is also known as a soloist; however, he is not merely a percussionist but an imaginative and sensitive musician. He has performed throughout India, UK, Europe, Middle East, Indonesia, and USA. He has performed for her Majesty the Queen as well as Prince Charles for a private concert at Highgrove. His recent concert venues include London’s Royal Albert Hall where he participated at the 100th anniversity of the proms. In 2000 he performed at Carnegie Hall in New York. He has worked with jazz, Egyptian, Spanish, hip hop, folk and blues music as well as composing various pieces of ensembles. Sanju has played for numerous live recordings- BBC TV, Channel East, Asian Net TV, BBC World Service, All India Radio and also on CDs with ARC Music and NA Classical India. In addition, he has performed at Glastonbury Festival, Royal Festival Hall, House of Commons, Salt Lake City for the opening of the Olympics, and is also working with Michael Nyman, one of the most celebrated British composers. Sanju is based in London and promotes concerts and musical education through workshops or individual learning. Sanju teaches tabla at London University and schools/colleges throughout the United Kingdom.